This week’s featured product is our classic princess diamond eternity band in platinum. This diamond eternity band can be coupled with a simple solitaire engagement ring or many different diamond engagement rings. An ideal present for an anniversary as well, thirty two princess cut diamonds, F color and VS2 clarity, are channel set in this exquisite eternity band. Approximately 1 3/4 carat total diamond weight and proudly made in the USA. Like this eternity band? Check it out here: Princess Eternity Ring. 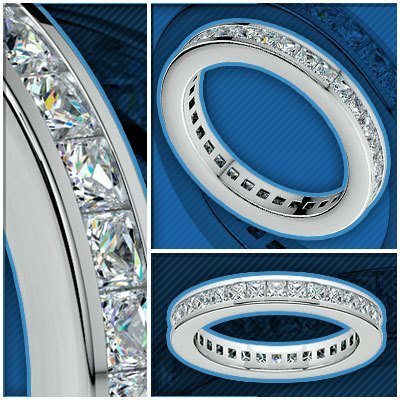 You may also browse our entire collection of eternity bands here: Diamond Eternity Bands.